The 73rd Executive Committee Meeting of the International Union of Geological Sciences (IUGS) was held in Beijing, China, on 27 and 28 February 2019. The meeting was sponsored by the China Geological Survey, the National Natural Science Foundation of China, and the Xiangshan Scientific Forum. 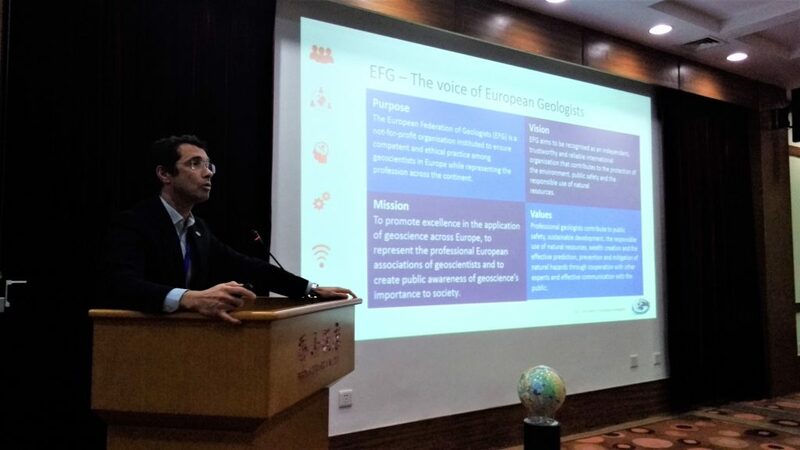 EFG President Vitor Correia presented at this occasion the Federation’s annual report for 2018 during a special session dedicated to IUGS affiliated organisations. He also presented the report of activities of the IUGS Task Group on Global Geoscience Professionalism of which EFG is a founding member. EFG President Vitor Correia presenting the Annual Report 2018.